A little compassion, zeal for problem solving, and a sketch on a napkin can do wonders to bring real world solutions for some people! Today’s post is written by Amberlynn Gifford, an occupational therapy student, who helped a student diagnosed with dysgraphia keep up with his peers by developing an iPad app for him. Steven* is a 5th grader that I met during my occupational therapy fieldwork this spring. He is diagnosed with Dysgraphia however his mind is sharp, but his handwriting is so messy that he can’t even read his own writing. His OT tried countless ways to help him improve his penmanship but nothing seemed to work. The caring OT went so far as to scan his worksheets into a computer but that consumed too much time during class was quite a hassle. Even worse, Steven was very frustrated and getting left behind in class because he couldn’t complete the worksheets with the rest of his peers. I thought that there had to be a better way to help Steven keep up with the other kids in his class. Then I had an idea, what if Steven could take a picture of his worksheet using an iPad and then type his answers directly on the screen? I searched all over the app store, but there was nothing that did what I wanted. Well, there were a few apps but they were designed for business people and were far too complex for a child to use. So I sketched out my idea on a napkin and shared it with Steven’s OT. She loved the idea. So I put together a detailed mockup of the app and worked with a developer to build it. A few weeks and a few dollars later, I had a working app! Steven’s OT and teacher are thrilled. However, the real joy comes from seeing Steven use the app. It’s effortless for him to take a picture of a worksheet and use the iPad keyboard to type in the answers. He’s no longer left behind in class and is now more confident than ever! While he continues to work on his penmanship, he’s now able to keep up with his peers. SnapType is an iPad app that anyone can use. It’s available on the app store for free and I’m hoping to help as many kids as I can by reaching out to OTs, teachers and parents. Super easy to use and fills a gap. Can you add a way to share the completed work? Hi! To save and share your work press the iPad home button and power button at the same time (this saves as screen capture to your iPad’s camera roll). From there you can print it or share it! Hope that helps! Thanks. I know about screenshots. I was hoping there could be a way within the app itself. You may want to consider it as an upgrade. In the meantime, it's quick and efficient when teachers hand out worksheets. Thanks for creating this. We use Paperport Notes for a similar purpose but this is so much easier, especially for the younger students who don't need all the features of Paperport. Thank you!! Currently I am paying for this out of my pocket (as a graduate student). Unfortunately, I don't have the money to add more upgrades at this moment. I plan to add upgrades in the future! Thanks for writing and I am glad it will be helpful to your students! Thank you, thank you, thank you. I'm a mother of twins. My son is autistic and my daughter has cerebral palsy. They are still only 2 and a half… but I'm sure they will both need and use this. The fact that you have also made it free and are paying for it out of pocket is just the sweetest thing ever. I read about this last night and cried tears of joy. There aren't too many people creating things that will help for no profit. You are amazing! And I'm going to be telling everyone who will listen about you, this story, and your app. Thank you again, I truly appreciate it!! Thank you for your kind words! I am so happy that my app may be helpful to you, as well as so many others! Thank you so much for sharing!! Currently there are no plans to do an android version. But if there's enough interest in the future I will consider it. Like I said previously I pay for this out of my pocket (as a Grad student) . Unfortunately I don't have the money to build an android version right now. Thanks for writing. Will this be available for Android devices? Hi I would just like to say that this is a nice and fantastic app and if you would like to get an android version developed you should go on to reddit on either androidapps or androiddevelopment subreddit and make a request about wanting help to get an app developed.There are many developers who would offer their time to get your app made.Give a description of the app and what it does on a post and also a contact. Thank you so much! I will definitely look into it! I am an occupational therapist and I work in the school system. 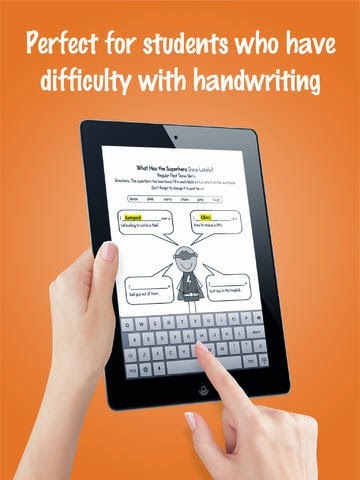 I just found this app and am trying it with some of my kids who have handwriting difficulties. I understand about saving the completed worksheet in pictures and printing from this. My question is, I have been playing around with this and have not yet figured out how to get rid of a worksheet to be able to start a new one. Thanks. You should be commended, this will be a great help to many kids. Thank you! I hope this is very useful! Start over by flipping the iPad face-down for 2 seconds. If you have any questions please let me know! Thanks for the directions. Maybe there would be a way to include them on the app. Congrats on a job well done. Would buy the app for his Surface in a heartbeat if it was available. Currently there are no plans to do a Microsoft version. But if there's enough interest in the future I will consider it. I paid for this app out of my pocket (as a Grad student) . Unfortunately I don't have the money to build an Microsoft version right now. Thanks for writing. Thank you so much Adele! I am so humbled to learn that I am helping out so many children! Thank you. You certainly have a heart for children with difficulties. My 8yr old has dyslexia/dysgraphia and sensory processing issues. Writing more than short sentences is a struggle for him. Now he can finish longer assignments and show his strengths. I am so happy that SnapType has helped your son! Thank you for your comment! Hi! I am not sure why that is happening. I have never heard of this happening before. I will look into it for you. Try deleting the app, and then installing it again. See if that helps! I can't get the screen to clear.. even after turning for 2 seconds and trying multiple times even longer. Any tips? I am sorry that is not working correctly, I am not sure why this is happening. Try to delete the app and re-instal it. See if that helps! Keep an eye out soon for some great new additions in the upgrade! Thanks for developing an excellent app. I know how to save a student's work but is it possible to then continue to work on the document if they didn't complete the work initially? Your insight and help is much appreciated. Your App is great! Do you have any suggestions for a similar app to help with high school math. I have found ModMath, but it's too basic. Thanks for any suggestions. Thanks so much! We are glad you enjoy it! Modmath is the one I know of as well. I believe they just raised enough money though to continuing developing their app further, so try looking into them again, and reaching out to them to see if they may have something that could help you. Thanks for writing in! This could be the answer to prayer for my 2 boys with Dyslexia and Dysgraphia! Especially the one heading into Jr High! We wish it was available for Android as that is what we currently have now! But thank you for this idea…we are working on getting the right tablet for the boys! You have certainly blessed us with this possibility! Thanks for sharing your story! We are so happy that SnapType will help your boys!! We are still in the development stages of Android. We are a small man (and woman) team of three with one developer. So we hope to get the Android version done soon! Thanks for your support! Another vote for an Android or Surface version please! I just learned of Snap Type from the OT in my school. We are having difficulty getting the keyboard and the work facing the same direction. (The worksheet is vertical and the keyboard is horizontal). How can we rectify this? With thanks. I just learned about Snap Type from the OT in my school. I think it will be very helpful for many students. We are having difficulty getting the keyboard to face the same direction as the screenshot. How can we rectify this? Thank you for your support. Thanks for reaching out to us. It's great to hear from you. Sorry for the hassle you're facing with the camera and keyboard. Unfortunately the iPad gyroscope is very sensitive and it's a known bug that it can be in the incorrect orientation, leaving you with portrait mode when you want landscape, and vice-versa. It's nothing you've done wrong. Unfortunately, It is is out of our control since it's a function of the iPad. However, one thing we've seen users do is to place the worksheet on a wall (with tape/magnet/clip), and then it's easy to take a picture while holding the iPad in front of you. We realize it's not perfect, but it may help. Let us know how it works out for you. Any ideas when the app will be ready for Android? My son greatly benefit's from this app, but he is using the teacher's ipad and he has an android tablet. This app is an answer to many prayers!! Thank you so very much for working to create this for Android. From what I've seen this could make an unbelievable difference for my son. You're amazing, thank you! Thank you so much for working on an Android version. From the amazing things I've seen this could make an unbelievable difference for my son! You're awesome! I send it to myself and then print it from my "sent mail" on my desktop computer. Have there been any gains made with an Android version? I would love this on our Android devices.